Villa Gianni is intended for nature lovers, who adore to be surrounded by whispering trees, twittering of birds and the soothing sound of the sea. The villa is situated on the extremity of foothills called Punto Caruso, where nearby we have the Negombo Thermal Gardens, and the Mortella Botanic Gardens. It is also near Forio city centre and Lacco Ameno. 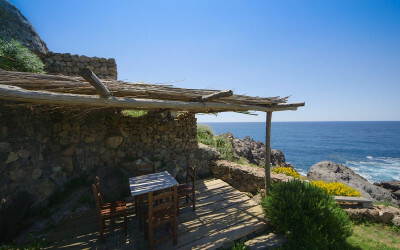 From the villa, paths spread out through the wood to lead to extraordinary rock formations and fabulous corners of paradise, from where you can admire the sunset and a breathtaking view of the beaches of San Francesco and Forio. It was recently fully renovated, the building has an area of approximately 120 m and is spread over two levels. On the ground level, there is a living area with a sofa corner and a dining area, a double bedroom, a bathroom with shower, the kitchen, a veranda, barbecue area and a small garden. Villa Gianni is a place of paradise which offers a relaxing break away from all the everyday stress.